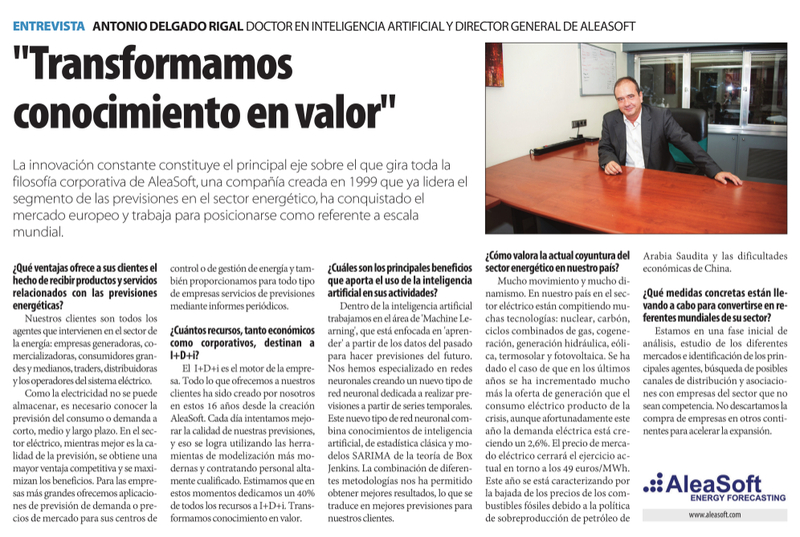 Interview with Antonio Delgado Rigal, Artificial Intelligence PhD and Director General of AleaSoft, within the Spanish Newspaper Cinco Días published on Tuesday September 29th, 2015. Constant innovation is the main axis around which AleaSoft’s corporate philosophy turns. The company, created in 1999 and leader in forecasting in the energy sector, has conquered the European market and is working to position itself as a world reference. 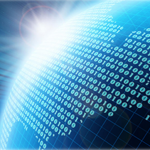 Receiving energy forecasting products and services represents some advantages. But what are the advantages for your clients? Our clients are all the agents who are active in the energy sector: generators, retailers, big and medium consumers, traders, distributors and transmission system operators. Since electricity cannot be stored, it is necessary to know consumption or demand forecasting at the short, mid and long-term. 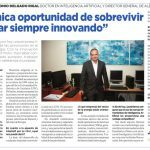 In the electricity sector, when the quality of forecasts is better, you can have greater competitive advantages and maximize your benefits. We provide bigger companies with demand and price forecasting applications for their control centres or their energy management and we also offer forecasting services with monthly reports to any kind of company. How many resources – including both financial and corporate resources – do you invest in R&D&I? R&D&I is the engine of the company. Everything we offer our clients has been created in our firm in the past 16 years since AleaSoft was founded. Every day we try to improve the quality of our forecasts and we achieve this by using the most modern modelling tools and by hiring highly qualified professionals. We believe that we are currently dedicating 40% of resources to R&D&I. We turn knowledge into value. Which are the main benefits of the use of Artificial Intelligence in your activities? Within the Artificial Intelligence we work in the “Machine Learning” area which focuses on “learning” from past data in order to make future forecasts. We are specialized in Neural Networks; we created a new type of neural network dedicated to making forecasts from time series. This new type of neural network combines knowledge of Artificial Intelligence, Classic Statistics and SARIMA models of Box Jenkins’ theory. The combination of different methodologies enabled us to get better results, which means we have better forecasts for our clients. How do you assess the current situation of Spanish energy sector? Active and very dynamic. In our country, within the energy sector a lot of technologies are competing with each other: nuclear, coal, gas combined-cycle, cogeneration, and hydro, wind, solar thermal and photovoltaic power generation. It’s been the case in the last few years where the electricity generation offer has increased much more than electricity consumption due to the crisis, but fortunately this year electricity demand is growing by 2.6%. The price of the electricity market will close the current year reaching 49 euros / MWh. This year is being characterized by the fall in fossil fuels prices, due to the oil overproduction policy of Saudi Arabia and to China’s economic problems. Which concrete measures are you adopting in order to become global benchmarks in your sector? We are in an initial phase of analysis. Studying the different markets and the identification of their main agents. Research on possible distribution channels and partnership with companies that are not competitors. We don’t exclude the possibility of buying companies in other continents in order to accelerate our expansion.